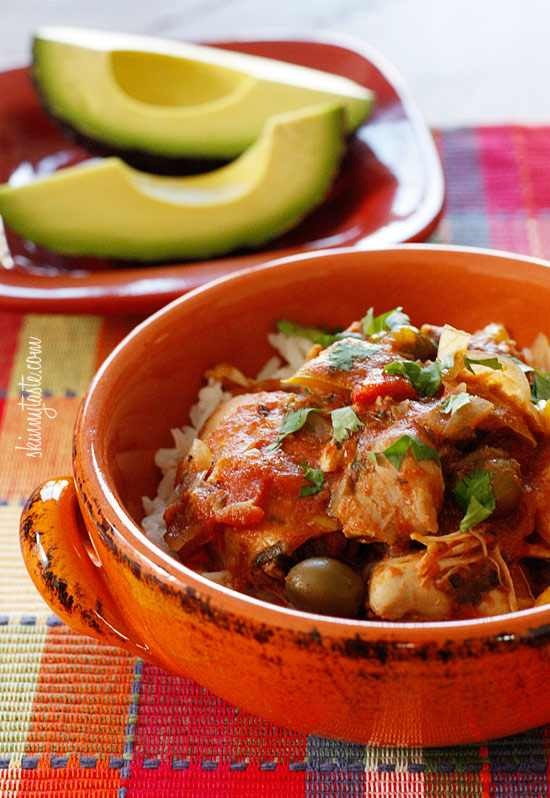 Slow Cooker Chicken a la Criolla features boneless chicken thighs with a Spanish influence! Use the Recipes-by-Photo Index Page for Chicken to see all the slow cooker chicken recipes that have been featured on this site. In this Spanish-inspired dish chicken thighs are simmered in the slow cooker with onions, garlic, bell pepper, tomatoes, Spanish olives, oregano, and cumin. Crock Pot Chicken a la Criolla from Skinnytaste sounds like it would be delicious served over rice, and Gina says this was a hit with her whole family. Get the complete recipe for Crock Pot Chicken a la Criolla from Skinnytaste. Use the Recipes-by-Photo Index Page for Chicken to see all the slow cooker chicken recipes that have been featured on this site. Is this blog going to be indexed on Eat Your Books? Pam, I don't know but I certainly would like it if it was! I just happen to have a package of chicken thighs in the freezer, so definitely make this. I wonder at the 2 tablespoons of green olives though. The photo shows them whole – perhaps they were meant to be chopped? In any event, I think that's something I could add more of since I'm not worried about the points. Lynn, you could ask that question in a comment on Skinnytaste, but I have no idea. More olives would always be good though if you ask me! Enjoying this new blog, very helpful thank you. Great to be introduced to new-to-me blogs as well as slow cooker recipes, with good reviews. I would like to know how concentrated an 8oz can of tomato sauce is please. (In NZ canned tomato sauce is what is known as tomato ketchup in the USA). I took a look on wikipedia and I'm still not sure….here I can buy tomato puree, tomato paste, passata, – which of these is going to give me approx the same moisture level? Of course there are canned tomatoes which I could prepare to the correct consistency too. Currently it's late summer here so in fact I can use tomatoes from the garden -have really been enjoying using home-made passata. However later in the year I'll be relying on what I can purchase. Glad you are enjoying the new blog. In the U.S. tomato sauce is much thinner than tomato paste, but not as thin as tomato puree. I would guess it's the consistency of tomato puree after it's been cooked down for an hour or so. Tomato sauce here is not quite as thick as tomato ketchup, but close to that consistency. Thanks Kalyn I'm new to using a slow cooker and still in the learning phase as regards getting the quantity of fluid about right ! Hi there, just curious, what is Eat Your Books? To answer about the olives, it's to taste, you can use whole or chopped, and pour some of the liquid from the bottle, it adds great flavor. Thanks for clarifying about the olives Gina. Eat Your Books is a site that indexes cookbooks so you can enter the books you have and search them through the site. About a year ago they started indexing blogs and Kalyn's Kitchen is indexed. Hi Kalyn, This recipe looks wonderful. I'd like to thank you for the new blog as I do cook everything from scratch. Thanks Elaine. Glad you are enjoying the new blog. I'm having fun finding good recipes for it.